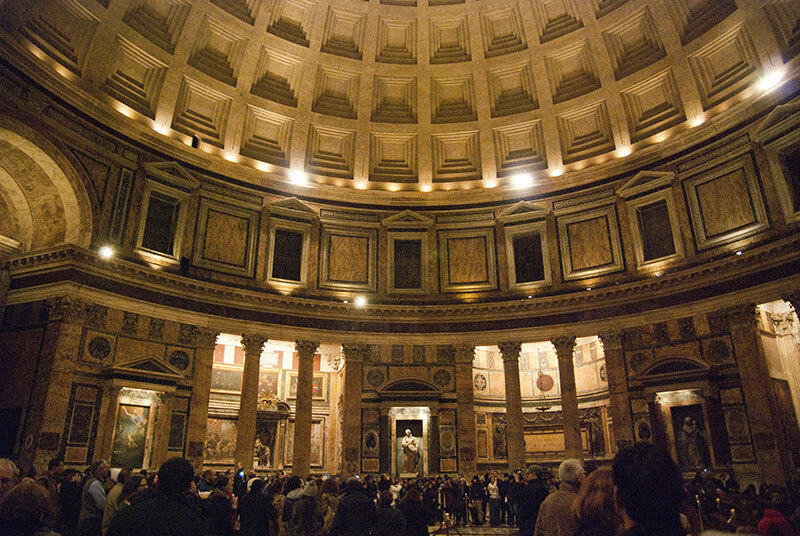 Pantheon in Rome is an impressive building and attraction. It was build by Agrippa between 27-25 BC and at that time it was an pagan temple for praying to all the gods that the roman people worshiped at that time. The temple was destroyed but was rebuilt again between 120-125 AD by Caesar Harianus. The new temple is believed to be a good replica of the original. In the 600s AD Pantheon was sacred to Saint Maria and the martyrs and since then it have been used as a catholic church. The building itself is a fantastic architectural masterpiece and inside you find many paintings and statues and also the tomb of Rafael. In the map you can see where in Rome you can find The Pantheon.